Need an exciting goodie bag for a Halloween party? Try out this adorable project! Cut out a layered pumpkin using an orange print from the stack. Assemble it together using adhesive foam squares between the layers, adding a section of black cardstock to show between the eyes and mouth. Cut a rectangle from a piece of brown cardstock; add it behind the pumpkin as the stem. Cut 2 scraps of green cardstock; curl the cardstock by rolling it around the pencil and adhere it around the stem of the pumpkin. Set these aside. Using a personal die cut machine, cut out the treat bag from a black printed cardstock sheet. Cut out a piece of printed cardstock for both the front and back of the box; adhere these in place, then assemble and adhere the box together. Cut out a section of spider webs from the silver glitter cardstock. Use the spider web and layered pumpkin to accent the front of the box. Repeat as desired, fill with candy, and watch as the lucky recipients enjoy their gifts! Using the image as a guide, sketch out a witch’s hat shape on the scratch piece of paper. Cut this out. Select a variety of prints. With the print facedown on the workspace, lay the template piece on the back of the paper and trace around all the sides. Flip the template piece over and trace around it again in a new space. Cut these out. Cut a small strip of a contrasting print to add to the hat on the front (just above the “brim”). Adhere this in place. Starting with the first set of prints, lay the cardstock rectangle vertically in the workspace. Score a small section (approximately 1/8” to 1/4") in on both the right and left sides. Fold these up. Adhere the inside of the hat sections (print side out) to each side of the rectangle. Pinch them together at the top and punch (2) 1/4” holes next to each other as shown. Thread a section of twine through the holes and tie them off in a bow. Add a piece of candy (preferably a lolly pop) to the center of the holder. Repeat steps 2-6 for the remaining cardstock sheets. 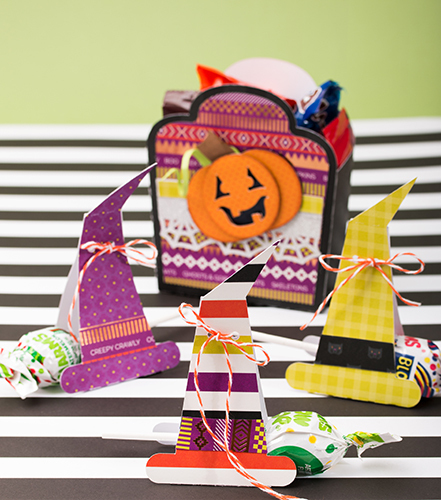 This project is also great even if it isn't Halloween yet, just change up the colors and patterns for the goodie bag!